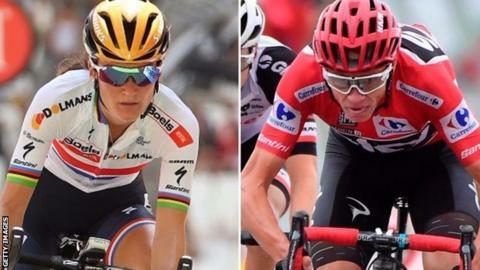 The World Road Championships take place from 17-24 September in Bergen, Norway, with live coverage across BBC TV, online and the BBC Sport app. As well as watching the action, you can read reports on the BBC Sport website and mobile app, plus interact and share your views on the action via BBC Sport's dedicated social media accounts (Facebook, Twitter, Instagram). In-form Dutch pair Annemiek van Vleuten and Anna van der Breggen start as favourites, while British hopeful Lizzie Deignan is fit to compete after recovering from having her appendix removed. Peter Sagan will again be the man to beat as he seeks his third consecutive world title. The imperious Slovak held off second-placed Mark Cavendish in Doha last year and will be looking for a repeat performance on the scenic roads of Bergen.